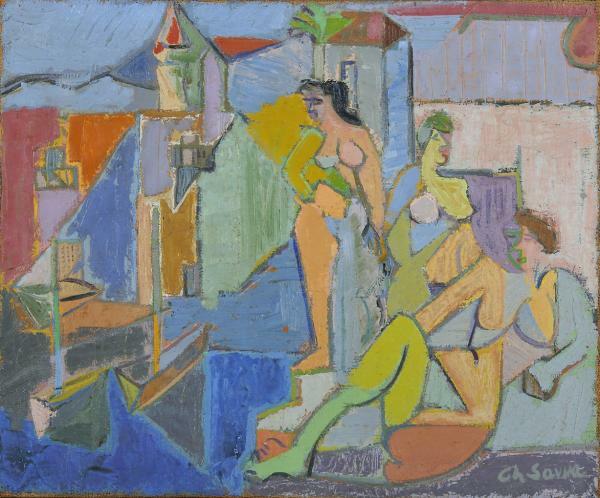 His oeuvre paved the way for new directions in Cypriot art. He was one of the iconic figures of the generation of artists in the 1960’s who were trying to keep up with the contemporary trends in the international art scene. 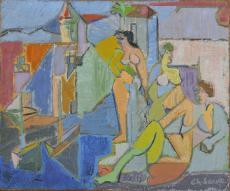 He painted ‘The Bathers of Kyrenia’ the summer of 1957 during the period when he was influenced by his Cubist teacher, Andre Lhote. Following Lhote’s teaching, he organized his subject based on harmony, balance and order. He chose a classical synthesis, using chiefly vertical angles whose static nature created an atmosphere of calmness and tranquility. He juxtaposed the strict , structured architectural elements of the left side of the composition with the more organic curves of the female figures; their geometric character allowed him to stay true to the classical synthesis. The careful use of light and the vibrant colours of the composition create a very pleasant atmosphere. Christoforos Savva was born in 1924 in Marathovounos village, where he remained until 1947. He studied at the Heatherley School of Fine Art in London and at Andre Lhote’s workshop in Paris.